Published in the South Kent Gazette, 4 February, 1981. Proceeding up the street a large building, numbered 49, 51 and 53 High Street, demolished as part of the Drum Holdings redevelopment and which used to be Turnpenny’s the furnishers, was once the residence and ironmongery warehouse of Alderman Matthew Pepper, an ex-mayor of Dover, whose ancestors were mayors and town clerks centuries ago. His life’s work in the field of local government was principally in connection with the care of the poor. He was Guardian for Charlton from 1876 and chairman of the Dover workhouse from 1892 until 1913. At one time he owned a considerable amount of property in the town centre. Betwixt High Street and the River Dour there lies an interesting section of the parish of Charlton, which used to be traversed by Maison Dieu Place, Wood Street, Peter Street, Bridge Street, and was also intersected at the north-east comer by Branch Street, Colebran Street, Brook Street and Catherine’s Place. Maison Dieu Place is the row of houses facing the northern side of the Royal Victoria Hospital, built, like the adjoining Wood Street and the adjacent Dourside Cottages, on part of Wood’s Meadow, about the year 1860. At the bottom of Wood Street used to be the offices of Messrs. William Crandall and Co., and their sawmills, which extended along the riverside to Spring Gardens in Peter Street. This timber yard had existed since Wood’s Meadow was transformed into building land about 1858 and continued in use until the 1960s. Previously, in the locality occupied by the sawmills, stood Dickenson’s paper mill, which was a conspicuous structure seventy years ago, having a tower, with a clock in it with four faces, which could be seen from all parts of Charlton. Mr. William Rastall Dickenson, who had previously owned the Buckland Bridge mill, was a member of the old Dover Corporation, and he was elected an Alderman of the new Corporation in 1835. He did not figure long after that (late in Dover affairs, his new paper mill, built in 1833, being unsuccessful, and he, in 1839, becoming a bankrupt, the works were stopped, and in May, 1840, the plant and the building materials of the mill were sold for removal. There was also a brewery in Spring Gardens, carried on by Mr. William Gardner. That also failed and in 1846 the brewhouse and plant were sold by order of the assignees. In marked contrast with those early Dourside industries, the timber business and sawmills of William Crandall and Co., established on this spot about 120 years ago, grew steadily into a great commercial undertaking with branches in London, Queenborough and Southampton. In Dover the laying out of the Clarendon estate, now one of the most heavily populated parts of the town, was commenced by this firm in the late 1870s. In the 1880s and early 1890s they laid out the Dover Castle estate, and later undertook the construction of homes on the Barton estate extending up towards the allotments and railway line to Deal from Barton Road. Prom the early days of these developments Sir William Crandall, who later became head of the firm, took an active part alongside his father who was the proprietor. Sir William, who died in 1934, was mayor of Dover thirteen times, a record which is unlikely to be beaten,, and was associated with many major developments in the town. He took up the pressing ma tter of street widening and, in the course of successive Mayoralties, he saw the widening of the main thoroughfare from the Market Square almost up to the Maison Dieu, as well as the widening of Worthington Street, Priory Place, the High Street, in front of the Town Hall, Ladywell, and the communications from Maison Dieu Road to the Sea Front, and of the Marine Drive round the Bay. Also during one of his Mayoralties the School of Art and Technology, in Ladywell, was built, adjoining the Maison Dieu, Lady Crandall laying the foundation stone. Sir William was also associated, with the introduction of electric tramways, which his street widening schemes had made possible. 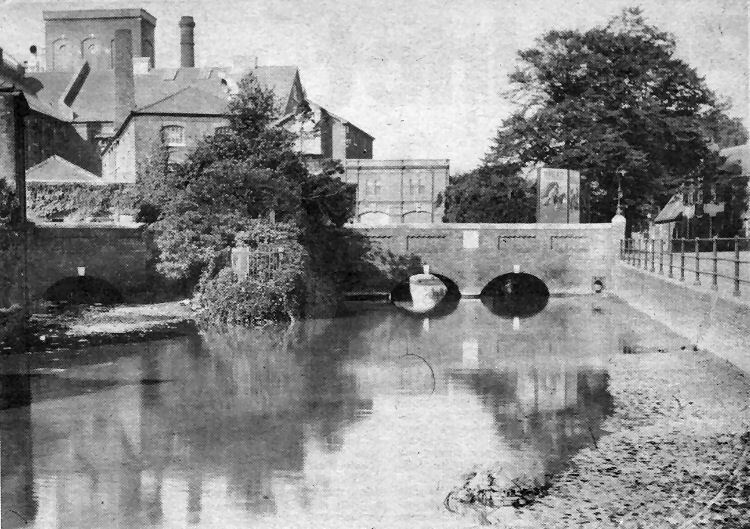 CHITTY’S old corn mill at Charlton Green, part of which survived until recent years, with the Red Lion public house on the right-hand side of the picture. The picture dates from the early years of this century. Above is The America, the largest liner in the world when this photograph was taken, on the occasion of the vessel’s first call at Dover, on 12th October, 1905, when she berthed alongside the Prince of Wales Pier aided by Harbour Board tugs, including the Lady Vita paddle steamer, on the left. 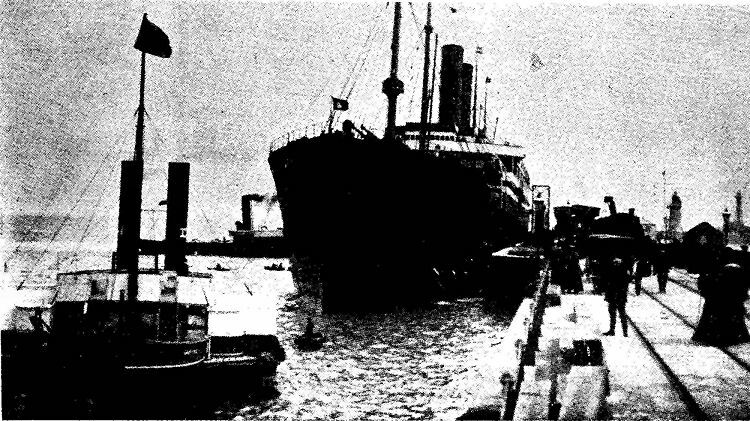 The liner was met at the pier by a boat train, shown on the right.